At WA External Solutions we are out to find the best solutions for you and your roof, for gutter protection the best product on the market is Gutter Mesh and we are the WA Agent for the product, whether you want to DIY it or have it professionally installed this is the product for you. Size does matter! the smaller the holes the less material gets thru and then can be washed out, if lots get thru then you are defeating the purpose of having it in the first place. we are number 1 for gutter mesh in the country and this is for a reason, we provide a great product and good service to support that. 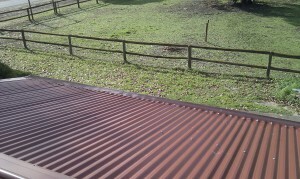 so call 1300 660 978 for an obligation free quote so we can sort your gutter issues out. we cover the state so we have you covered, of course if you are a long way away then we will give the necessary instructions for you to do on your own.This is the best form of gutter protection you can get.